Call us at Buongusto Pizza if you’re in need of top quality corporate catering service in Little Falls. When it comes to Italian meals and pizza, we’re known for having a great selection of options. This is why so many local residents count on us to cater their events. The food is very essential, regardless of what kind of event you are planning. It is essential to be sure you’re making the right choice if you’re hoping to make your guests happy. A broad array of pizzas, pastas, appetizers, salads and entrees are available for your next. If you have a large group, a buffet might be the best choice, providing an array of options for everybody. 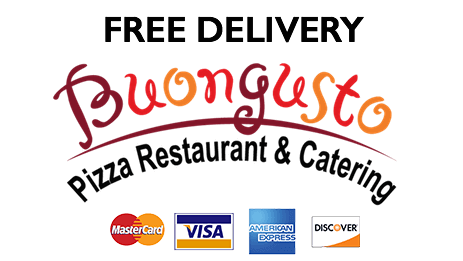 When you’re trying to find a great choice for Italian catering in Little Falls or the rest of the local area, don’t hesitate to make Buongusto Pizza your first choice. When you need full service catering for events in Little Falls, Buongusto is one of the best choices you’re capable of making. Making sure your event goes well is your top priority. This calls for ensuring the company you hire can provide amazing food as well as amazing service. At Buongusto, we’ve worked with a wide variety of clients in the time we have been doing business. We’re the ideal choice for catering your next event as a result. If you are hosting a meeting with VIP clients, it is essential to make a good initial impression and food goes a long way towards achieving this. If you’ve got a long day of meetings with your employees, a break for food is essential. A great tasting Italian meal or pizza will make certain they are able to face the long day ahead and feel appreciated as well. Get in touch with our experts for full service Italian catering in Little Falls or other local areas if you’d like to learn more about how we can help you with your next event. Make certain you make Buongusto Pizza your first if you are trying to find a company you can depend on to make your life easier in terms of full service catering for events in Little Falls or the rest of the local area. Planning an event is capable of being extremely stressful. It doesn’t matter how big it is or what kind of event you’re planning. Making things as easy as possible for our customers is our goal. This way you can focus on your event, not on preparing and serving the food. A broad array of menu choices are available when you choose Buongusto Pizza. This means getting exactly what you’re looking for isn’t going to be an issue. Ensuring that all of your guests are satisfied and your event goes precisely the way you want to is our goal. It doesn’t matter if you’re planning a birthday, graduation, family reunion, or wedding. If you’re not sure what you are looking for, our professional catering experts are here to help. The next time you’re in need of full service party catering in Little Falls or the rest of the local area get in touch with us right away. At Buongusto Pizza we offer great high quality food, which is the reason we are such a top choice for full service catering in Little Falls.